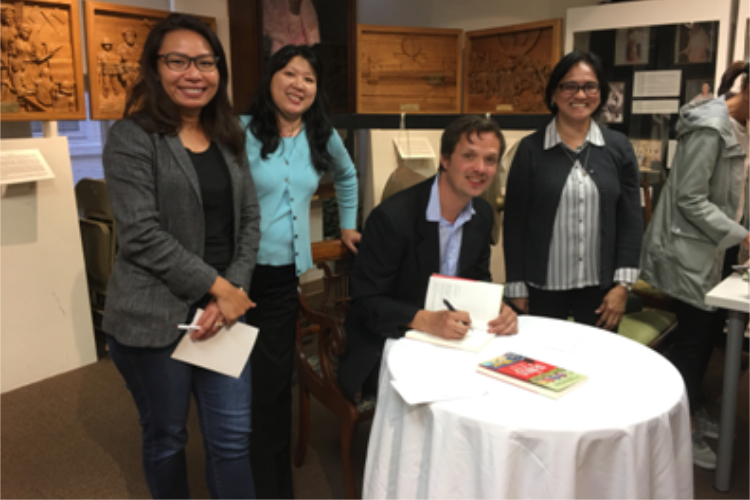 We have been fortunate to host, together with the Philippine Consulate General in San Francisco and Department of Tourism, Mr. Thomas “Tom” Graham, Founder of MAD Travel, author of the book “The Genius of the Poor An Englishman’s Life Changing Journey in the Philippines”, and an advocate for social tourism. Where did such love for the Philippines come from, more so from an Englishman? Curious, I took on his challenge and started by reading his stories of the Filipino communities that changed his outlook in life and even do a 360 degree turn on his career. A British journalist assigned the task to explore and produce business reports on one of the fastest growing economies in Southeast Asia, Tom visited the Philippines in 2012. Tom’s impressions of the Philippines has been a view from the top and the scene before him seems to say it all – a booming metropolis, with impressive new towers. But, his eye also captured the “growing pains” of a developing country and delved deeper in search of the “missing middle”. That led him to Tony Meloto of GawadKalinga, who brought him to an incredible journey through the eyes of the GawadKalinga communities who forged forward in making better lives for themselves in partnership with the GawadKalinga volunteers. I emphasize partnerships. Partnerships which led to the discovery of Filipino’s capacity for fun, resilience in adversity, strong sense of family, the gift of hospitality, a propensity to collaborate, and resolve to overcoming the odds. These are Filipino characteristics that we oftentimes as Filipinos take for granted and it is humbling to have this sense of pride rekindled by Tom’s stories. Toms journey inspired him to establish Make a Difference (MAD) Travel, a social enterprise that creates opportunities for and with marginalized communities through sustainable social tourism. MAD Travel creates alternative travel experiences that bring together people from different walks of life , immerse them in local culture, and inspire them to make a difference. A Trade Officer advocating for social tourism? We have seen the potential for synergy between DOT and DTI on trade and tourism. I have met many foreign business owners in the Philippines sharing with me their stories of visiting the Philippines as a tourist; enamored by its beauty decided to set-up their businesses. They started as a tourist and stayed-on as business owners sharing the Philippines’ growth story. There is also much alignment with advocacies on Filipino cuisine and the creative economy. But social tourism is a collaboration we are all excited about. Social Tourism is a platform that foster social entrepreneurship. For one, MAD Travel is a concrete example of how a social immersion inspired an individual to engage in social entrepreneurship. I believe that social entrepreneurship is a concept better understood through the stories of those who engage in such endeavors like that of Tom’s. Human Nature, which is now the Philippines’ leading brand of natural, locally-sourced and processed, healthcare products; Bayani Brew which thrives through partnerships with farming communities and now in mainstream grocery stores in the Philippines; Gourmet Keso, whose local and natural ingredients are even enjoyed by GawadKalinga’s cheese-loving French interns, referring to it as “French-approved cheese; and Plush and Play, which offer quality stuffed toys and the source of income for 500 families by 2017, are among the stories of transformation through social entrepreneurship. More and more people are beginning to see the Philippines as a viable destination to discover their purpose and passion as a social entrepreneur. Since its inception, MAD travel has arranged visits for 1,500 visitors mostly from France, UK and other Asian countries which contributed to 200-300% income increase for the eighteen (18) livelihood sources. Through DTI’s Trabaho, Negosyo, Kabuhayan “OFI’s as Catalysts for Growth” program and the Philippine Consulate General in San Francisco’s Spark Connect Empower (SCE) Movement, the 3.7 million Filipinos in the United States and FILAM organizations can all be catalysts for growth and transformation. I now echo Tom’s call to action to our TNK and SCE partners “time for adventures that matter in the Philippines”. Trabaho, Negosyo, Kabuhayan (TNK) is a new government blueprint for decent job creation through employment and entrepreneurship. It was a joint effort of the Department of Trade and Industry (DTI) and Department of Labor and Employment (DOLE). DTI and DOLE’s advocacy to create 7.5 million jobs in 2016-2022 and support income-generating opportunities. Spark Connect Empower or SCE is a movement intended to spark love and passion among all Filipinos (including those of Filipino lineage) – both at home and abroad–about their Filipino culture and heritage; connect them with one another, and; in the process empower them as individuals and as a community. Contributed by: May Nina CelynneLayug, Trade Commissioner, Philippine Trade and Investment Center-San Francisco.